Lodge : (906) 387-4918 (10am-4pm, Thu-Sun). E-mail: info@valleyspur.org. Comments on https://www.facebook.com/valleyspur generally answered daily. Getting there: Stay on M-28 highway through Munising, heading east. About one mile out of town, turn southwest on state highway M-94 approximately six miles. What's there: Valley Spur, a favorite Alger County destination for many dedicated cross country skiers, hikers, and mountain bike enthusiasts, is located on M-94 approximately 5 miles west of Munising, Michigan in the Hiawatha National Forest. The 27 mile (45 km) cross country ski trail system is groomed daily or as the need arises from December through March so that the trails are always ready. All trails are groomed for both skate and classic ski. Down hill trails are designed with run out and good sight distance keeping safety in mind. Valley Spur usually enjoys a deep snow base getting heavy accumulations from the lake effect snows off Lake Superior which make for a truly unique skiing and snowshoeing experience. 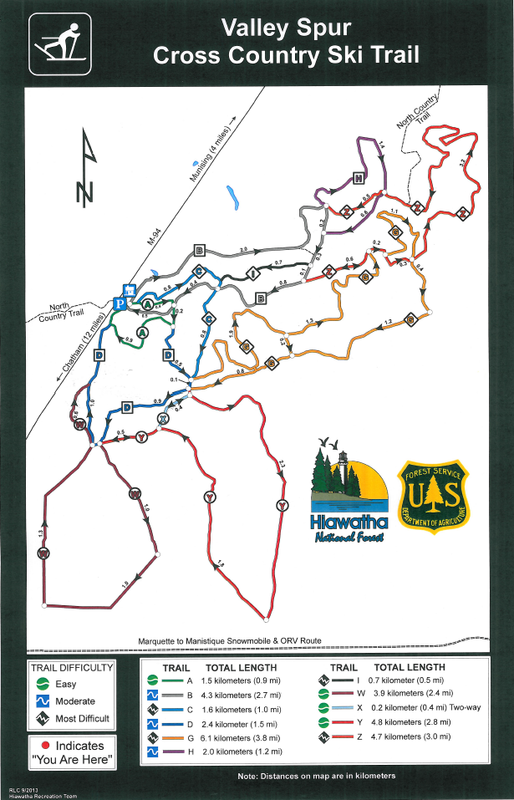 Trail map is Posted in the lodge and are posted throughout the trail system. Maps are also available for printing on line. In summer most of these loops are used for mountain bike and hiking trails. A variety of scenery, including hardwood forests, hemlock groves, pine stands and a small stream make all 10 loops interesting. Trail “B” is 2.8 miles which follows an old logging railroad spur, hence our name “Valley Spur”. The expert trail “G” is located on a terminal moraine left by the glaciers of the past. Several of the downhill runs follow the old glacial stream beds. The ”H” loop, an intermediate loop, goes through an old growth eastern hemlock stand(Worel’s Woods) that is estimated to be around 300 years old.